Hi Friends! Happy Hump Day! Tuesday really felt like a Monday all day so no doubt today will feel like a Tuesday! 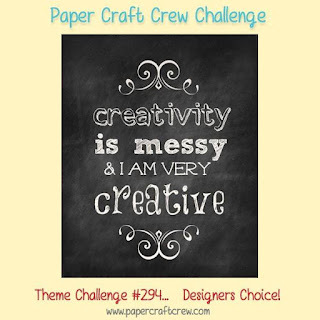 Well today is another Paper Craft Crew challenge and seriously this one is hands down my favorite challenge because we can do whatever our little heart desires! I just received my stamps and dies from the new Concord & 9th May 2018 release and I had to use the awesome Geode Bundle! What is super cool is the size of this geode! I had to use it to make a shape card since it was large enough! The card measured 4 3/4" wide by 3 1/2" tall! I stamped the geode on Bristol Smooth Cardstock with Versafine Onyx Black Ink and then clear embossed it. I used a mixture of Distress Inks and Distress Oxides to watercolor the geode. I spritzed it with some water and patted it with a paper towel and then heat set. I used the coordinating die to cut the geode out and then also used the same die to cut an A2 Black cardbase by putting the top of the die just above the fold so that there would be a flap that would not cut through. I adhered the watercolored front to the black card base with Tombow Multipurpose glue. 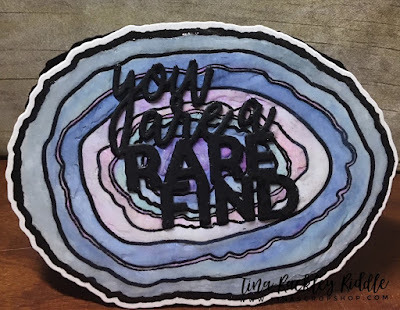 I cut the "you are a Rare Find" sentiment out 4 times in black cardstock and stacked them and then adhered to the front of the geode with more of the Tombow Mutipurpose glue. Finally I added a boat load of Glossy Accents to the front of the rock so it would look like a rock... lol It really turned out super cool but unfortunately by the time I finished it the lighting was not really good enough to get a great picture! Trust me... it's awesome! My oldest son, Trent has loved rocks since he was a little boy and especially geodes so I'm going to use this one for him!